This morning I ran the Dirty Sock 10K trail run for the fourth time since 2009 (I skipped it last year). Results have been posted, but they seem to be clock, not net times. Either way, it was the slowest time I've ever run this race. But in a race like this, experience is more important than time. As usual, the experience was great. Team Emerging Runner arrived about 35 minutes before the start under overcast skies and fairly cool temperatures. Far better than in 2010, when the heat, humidity and occasional rain created sauna conditions on the course. After getting my bib number, along with the traditional pair of "Dirty Sock" sweat socks and race shirt, I regrouped with my family. 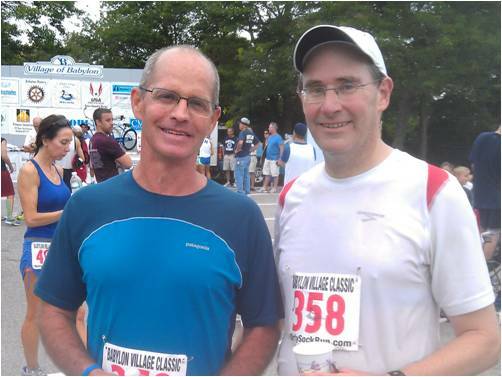 Shortly after that, I ran into my friend Mike who was running the race with his brother Paul. We walked together toward the western trail head, and told my wife and kids, "See you at the finish line." 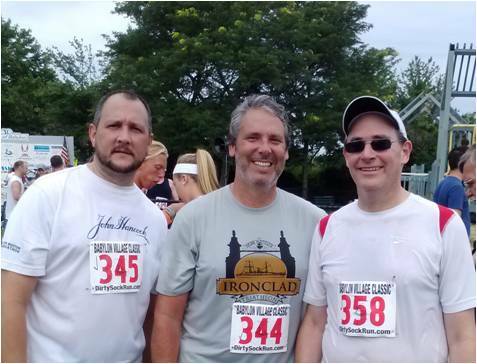 Mike, Paul and I continued toward the starting line and found a place to wait. At 7:55, I turned on my Garmin, thinking five minutes would be enough time to acquire a signal. I was wrong, and it took about 23 minutes for the signal to lock in. My hope of capturing full race data was lost, but I was getting my heart rate in real time and the watch came in unexpectedly handy near the end of the race. A video on the Dirty Sock Facebook page confirms that it took about a minute for me to cross the starting line after the horn. I'm hoping they post the net times, because this would make a difference in my overall time, bringing my pace into the 9:00 range (if only by 5/100th of a second!). I felt good at that point (although frustrated by my Garmin's signal failure), and moved through the crowd of runners until I found a spot where I could open up my stride. The first two miles went by fast, and I was beginning to think I might do well today. Like other times when I've run this race, the lead runners (winner set a course record of 32:48) were coming back after circling the lake, just as I prepared to turn right toward the Southern State underpass. It was a psychologically positive moment that confirmed my performance was on track. The transition from trail to pavement felt jarring, and I struggled a little as the course rose to the path that goes around Belmont Lake. The three mile point comes about halfway around the lake and the clock showed that 29 minutes had passed. Thinking that we'd be measured by net time, I was feeling encouraged. But soon after that, I began to feel depleted. I took a sip from my gel flask where I'd mixed some Roctane with water. That helped a little, but I needed to adjust to a more sustainable pace. As we crossed under the low viaduct that leads back to the dirt trail, I thought about what I needed to do to get through the rest of the miles. Without my GPS to tell me where I was in my progress, I tried to remember landmarks that I'd seen on the way up. I wanted to know how much trail I had left to cover. 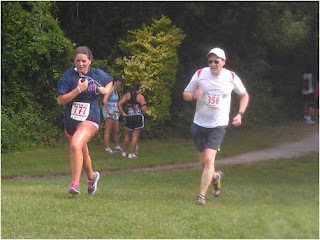 I started to get passed, indicating that I was running slower than I'd hoped. I finished the Roctane and soon saw the five mile clock that showed 50:40. I put everything I had into it, but still couldn't generate the speed I needed. Not long after that, my Garmin beeped that a new mile had started. Although it didn't correlate to the course, I used it as a rough estimate for the remaining distance. Knowing that I only had a mile left put me in a state of hope. When I passed Southards Pond, I knew I was about to turn right for the final kilometer of the race. Halfway along that section of trail, my Garmin showed I had a half mile to go. I prepared for that, but when I saw a familiar landmark I realized the watch distance was off (compared to the course). I was really much closer. I put everything into my effort and soon heard the race announcer's voice. I only had a few hundred feet to go, so I accelerated once the finish line (and my wife and kids) were in sight. I was fully depleted when I finished and my kids quickly brought water and bananas to aid my recovery. I was wishing for some electrolyte drink, but there wasn't any available. Although my heart rate dropped quickly to normal, it took about 30 minutes before I was feeling like my old self. Mike and Paul finished just a few minutes after me, and I was happy to run into Dave, who ran the course in the mid-50 minute range. We waited around and watched the award ceremony which was followed by an endless raffle where a hundred or more people won prizes. By then it was raining, but we hung in because my daughter was convinced I'd win the large screen TV (sadly, I didn't). One of the other big prizes was a $2,500 gift certificate from a hair graft surgeon. That was won by a high school-aged girl, who accepted it with good humor. Although I would have liked to run today's race a few minutes faster, I was completely satisfied with today's effort. My first half performance compared to the second indicates that I need to work on my base, especially if I expect to be competitive at Cow Harbor in September. Five weeks should be more than enough time to prepare for that course, but I'll need to do plenty of hill, speed and distance training to get where I need to be. So, it's a mixed surface course. I've never run one. Is it very technical? Do you have a goal for the CH? I feel badly for you about the Garmin. It's beyond frustrating. I'm so glad TeamER had a great day!! My son always appropriates the socks, but my daughter got dibs this time. It's a cute idea. This year they provided tube socks, but in prior years, they've been crew length running socks. The Dirty Sock course is mostly dirt trails and not at all technical. The only paved section is the path around the lake and the road that connects to that. The GPS snafu annoyed me briefly, then I decided it would be interesting to run without real-time distance displayed. I was familiar enough with the course (and there were timing clocks at 1, 3 and 5 miles) so it was fine. Time for us to focus on Cow Harbor now! My goal for CH is 58 minutes, give or take. How about you? You've got great pictures of your day! I was considering going down there to take pics, but now that I'm back, running in the morning takes precedence. It's like volunteering at races. I want to do that too, but that takes up even more of the morning. So, do I run a race, train or volunteer? I wanted to get down to Oyster Bay on the 24th and watch (take pics, volunteer) at the Tri this year,(since I don't participate in the action) but I'm working until 1:00. It's always something..
Not technical? Perhaps I'll try it then next year! As you, I'm looking to run the CH in under an hour. Anything less than 58 min would be a PR for me. Dirty Sock is a good introductory trail race. But it is a tough event and good preparation for Cow Harbor (although there's nothing like the James Steet. hill on the course). You'll do well, I suspect. 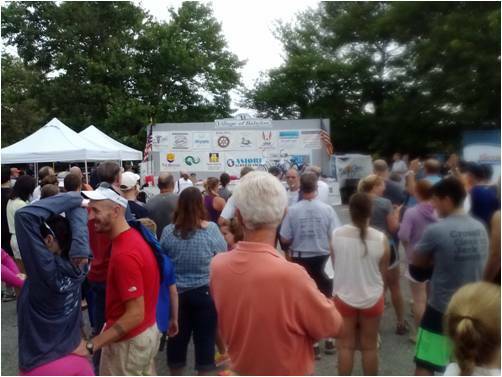 Fun race report! Sounds like a really nice race/course. Robert. Thanks - Dirty Sock is always rough but the race is still a lot of fun. The beautiful views of the lake and woods helps keep your mind off all the work you're doing! Congrats on a great race. Some days are easy, some, not so much. You persevered and finished strong. Here is the link to the Cow Harbor training runs. The Northport Running Club organizes them for FREE! I'm not sure if you've ever done them. I did it once last year and I really think it helped me. The course was fresh in my mind race day, and I knew what to expect (I had only run it once before in 2004). I'm not doing it this year, but I wish I was. I love the James Street challenge. Thanks! I've run Cow Harbor the last three years and have done a few training runs along the course with friends. This looks more organized and probably safer. My only issue is the long drive to Northport on a Wednesday night. In the past, I did those practice runs very early on weekend mornings. Unlike you though, I have nightmares about James Street.